Existing in a space between imaginary and real, child and adult, natural and artificial; structures grow and degenerate. 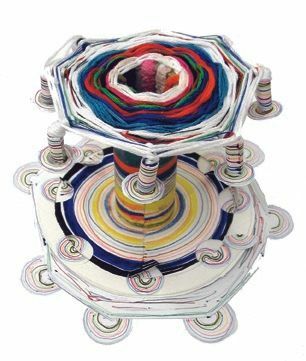 They are stacked, wrapped and suspended; balanced, threaded and shredded; cut up, patched up, repaired and decorated: spontaneous life subject to ongoing transformation. Familiar materials become abstract events; awkward structures that spark connections to things in the real world where the artificial, saturated palette of play, domestic and celebratory materials creates crystalline forms that are ambiguously spores or air ships, totemic and telescopic trees, space stations or new planets. 10 x 10 Projects is a miniature platform for artists to present a snapshot of their current practice. 10 x 10 provides a space for experimentation and reflection in the relaxed environment of the cafe at HOUSE.